Flexible Liquid-Tight Tubing is utilized to protect exposed wires. 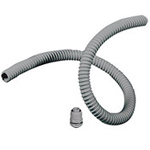 This tubing is PVC and is available in a variety of sizes. These flexible conduits are UV resistant, Shock resistant, compression resistant, and self-extinguishing.